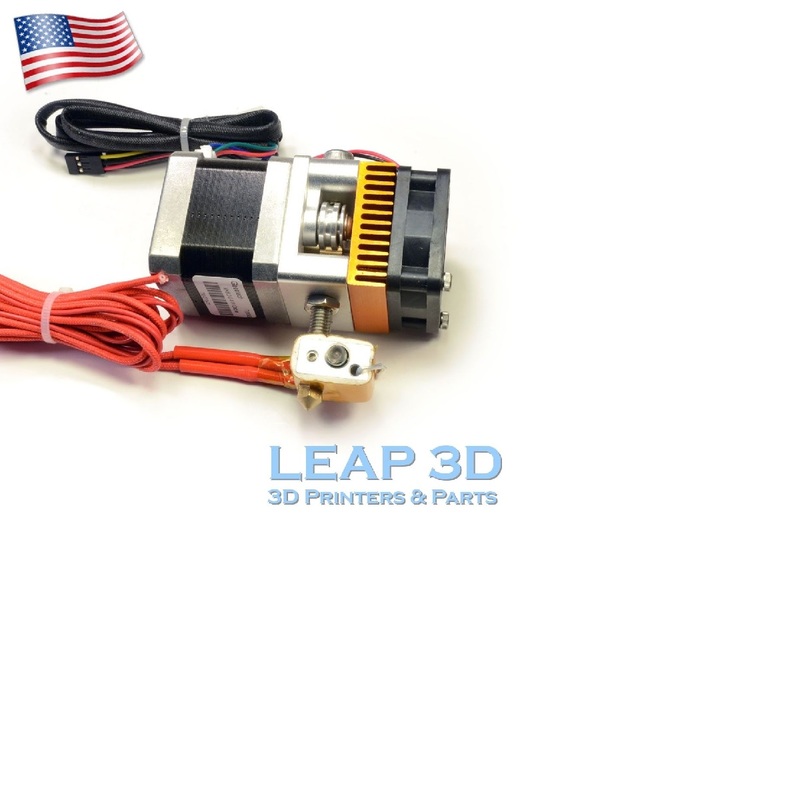 Are direct drive extruders any good? Re: Are direct drive extruders any good? Nope, it's actual current divided by rated current, so any motor run at it's rated values makes that section a '1'. . . thus rendering it a non factor . . . it's just there to scale torque for other drive currents. Holding torque doesn't vary much with motor current rating. You will often find different motors in the same range, with the the same size but different current rating (and different resistance and inductance), but virtually the same holding torque. Look at it this way. Suppose you take a motor and replace its windings with wire having half the cross sectional area. To a first approximation, you can fit twice as many turns in. The winding will then have 4 times the resistance. So you can run it at half the original current for the same power dissipation. But you have doubled the number of turns, which compensates for halving the current, so you get the same torque. Holding torque does vary with motor size, for example 48mm long motors typically have around twice the holding torque of 34mm long motors. When choosing stepper motors to work with standard drivers, I suggest you choose the motor size and length according to what holding torque you require, with a current rating a little higher than your driver can comfortably handle, so that you can drive the motor up to about 80% or 85% of rated current (any more and the motor will get hot). For standard A4982 or A4988 drivers, this means choosing a motor current rating of about 1.5 to 1.7A. I'd be interested to know what values people get from this formula using known working extruders. The lower limit of 5500 I suggest is conservative, and there may be working direct drive extruders that manage with a lower figure. Edited 1 time(s). Last edit at 07/19/2015 05:24AM by dc42. This is what is on my I3 and works good. I've been using it for about 6 months. I decided to give this one a try. Will need two but only ordered one to test. I broke it down when it arrived and the opposing gear filament drive looks solid and well made. The housing is well made too. Runs off a geared Nema 17. @DC42 - I notice your formulae assumes 1/16 microstepping, if you lower the number of microsteps/step from 16 to 8 you double the holding torque (at the expense of some resolution), so in theory that allows a smaller (lighter) motor on your direct drive extruder. For a typical direct drive you might be looking at 75 steps/mm, instead of 150 steps/mm for 1/16 microstepping. Has anyone tried this, is it practical? Edited 1 time(s). Last edit at 11/20/2015 05:07AM by Dark Alchemist. I await Skynet and my last vision will be of a RepRap self replicating the robots that is destroying the human race. No, reducing microstepping only reduces the torque per microstep. The torque per unit angle error remains the same. The only situation I can think of in which reducing microstepping is a good idea is if your electronics can't generate the step pulses fast enough. I have always used microstepping for all motors but if I go to a direct drive would it be best to go to full steps? I have been told full steps is loud and not worth it but I have no idea for the extruder. I already answered that question in the response you quoted. You said reducing microstepping I am asking how low to go? I see a lot of advocates for full stepping or half stepping or even quarter stepping for these things. I was going to do full or half stepping on Z and when I looked around it seemed to be a can of worms on that subject. OK, I said it only makes sense to reduce microstepping if the electronics cannot keep up. The same goes for turning off microstepping altogether. With a direct drive extruder, the electronics will always be able to keep up because the steps/mm is lower than for a geared extruder. Very good to know and that increases the torque too, or so I read. Now with a geared extruder things change so I guess keep the microstepping on? I use the Wades made for the i3 rework (43:10 so a 4.3:1 ratio) and I never knew what microstepping to use so I just left it at 1/16 (the lowest setting). With a geared extruder, the step rate is higher, but the electronics can normally still keep up with the step rate even when doing high speed retraction or filament loading. So it is usual to use the highest available microstepping still. I guess there are some combinations for which that might not be true, such as a DRV8825 driver (which can do 1/32 microstepping) used with a 0.9deg/step motor (which needs twice as many step pulses as a normal 1.8deg/step motor), a highly-geared extruder, and 8-bit electronics. Thank you as I plan to go to a direct drive mechanism and I now know to make it 1:1. Will the motor get hot? I have read it will and to use a fan or better yet a heatsink on the motor but the only one I saw was in GB with shipping being hellishly expensive so around 18 dollars for each heatsink. If you run the motor at 85% of its rated current then you will lose only 15% of its potential torque, but it will dissipate 28% less power and run warm but not too hot. Ahhhh, most excellent as I try to run all of my motors at 1.35A for a 1.5A motor so that works then. I am just dieing to try direct drive AND I just wish they could come up with the flexishaft drive that is reasonable in price but luckily people are trying so we will, hopefully, get there so the motor is stationary and off loaded. I had used one of the commercial one that use direct drive... Result is very good. Except the temperature must set higher by5 degree. What is the unit of holding torque in your formula? I am trying to calculate this for a 48mm NEMA 17 motor with holding torque of 5.5 kg-cm (0.54 N-m) rated for 1.5A per phase (running at let's say 1.2A) at 1/128 microstep settings (1164 microsteps per mm). If that's right that should mean my motor that I would consider to be pretty beefy is actually not beefy enough to do the direct drive! My BullDog XL extruder and E3D v6 hot end have been extremely reliable for over a year, with only 1 jam due to a foreign object in the hot-end. The torque in my formula is in Nm. However, the formula assumes 16x microstepping and 1.8deg/step motors. If you use 128x microstepping then you need to plug in the equivalent number of steps/mm at 16x microstepping, so divide your steps/mm by 128 and then multiply them by 16. For 0.9deg/step motors, also divide the steps/mm by 2. The only reason that the steps/mm is in the formula at all is to work out the effective radius of the hobbed bolt or insert. pull up a old thread. .8/1.75 * 0.4 * 500 = 213 ??? Edited 2 time(s). Last edit at 10/17/2016 04:30AM by ekaggrat. Looks like I made a mistake and the units should be Ncm. My extruders work out in the range I suggest if I plug in the torque in Ncm, e.g. one of my extruders is 420 steps/mm and 22Ncm holding torque. .5/.8 * 21 ( 420*5 ) *500 = 6560 .. so in theory it should work.. the main advantage with this would be a 150 gm motor resulting in a light weight extruder .. The steps/mm for a direct drive (i.e. un-geared) extruder at x16 microstepping is WAY lower than 500, more like 100. But if your motor has a 5:1 gearbox built in, then your figures look about right. Edited 3 time(s). Last edit at 10/17/2016 01:19PM by dc42.